That issue has been fixed (today) with the upgrade to Askbot version 0.7.48. The "suggested threads" drop-down is bumping the text currently in the "answer" field off to the right. That's wrong. The text shouldn't jump. Once my cursor is in the "Answer" field, the "suggested threads" drop-down should go away. Of course, I can't get the cursor back into that field, given the problem in #1! It would be very good if Askbot developers could fix this. Thanks! Update: I just checked at Stack Overflow =/ There, the "suggested thread" drop-down pushes down the question text-entry box, so it is always visible and available, even though the thread suggestions persist when the cursor in that main text field. Better than Askbot, it has to be said! After some testing: really annoying. AskLibO is still running Askbot version 0.7.43. Maybe, a required update to Askbot version 0.7.48 will solve this issue. Thanks for update @manj_k - it seems a small thing, but it's these niggles that can inhibit the growth of this site. It works very nicely at Askbot.org - same behaviour as Stack Overflow, in fact. Would be nice to have that here, too! Looking at the above mentioned bug 61098, It seems they have a manpower issue. On one side it is good to get a list of possible answers before writing and sending a question, on the other side, the proposed links hardly ever are related to the questions I have. Thus, is functionality is close to be a pure annoyance. 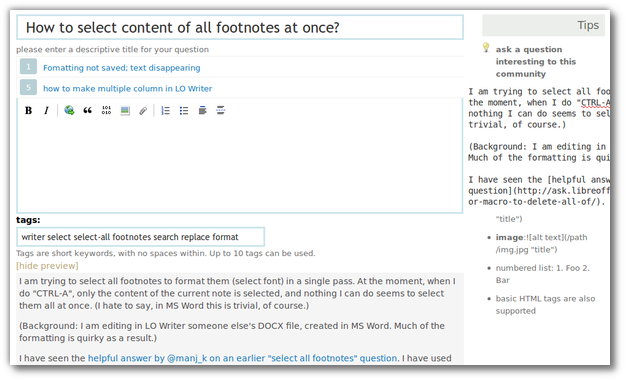 My work around is first to type my question and add at the end the title line to my question. I hope someone stops or improves this current default setting. 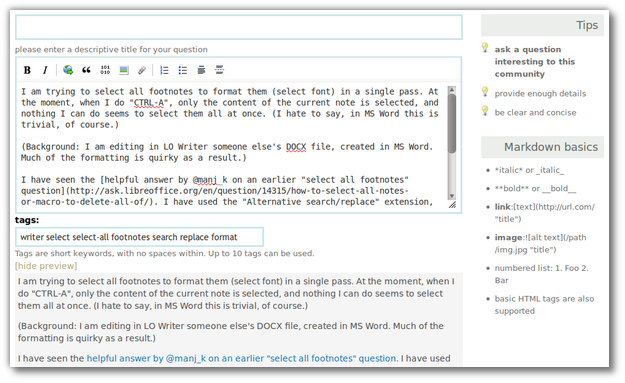 Can questions be changed to comments in ask libreoffice Q & A site?